I was born in Mestre (Venice) on April 11th, 1976. With a technical education on my back and having developed a passion for music as an amateur, I attended several courses for classical guitar, in preparation to the exams of the Music School (Conservatorio). 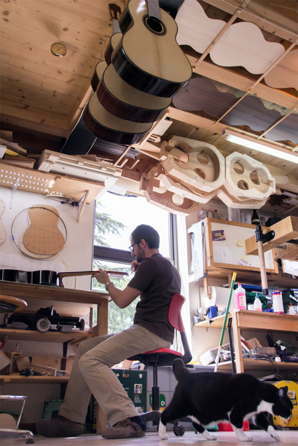 I came then close to guitar-making and tried to make a guitar by my own. Afterwards I attended the workshop of Mario Novelli, who taught me and cared for my professional growth. Starting from autumn 2003, after quitting previous occupations, I devoted my entire time to the making of classical guitars. I attenended contemporarely the course on manutention and repair of bows, by the Civica Scuola di Liuteria in Milan, held by Pietro Cavalazzi, and the course on the making of violins by the Scuola di Liuteria di Pieve di Cento (Bologne) held by Marcello Bellei. ​My professional activity has been permanently carried on since february 2004, and it is based on a costant research, thanks also to the precious advices of guitar players and teachers of Music Schools.